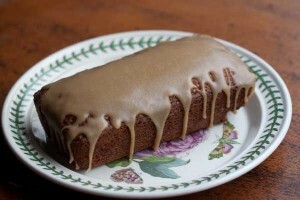 An easy applesauce cake baked in a loaf pan and drizzled with caramel icing. Preheat oven to 350 degrees. Grease and flour an 8x4 inch loaf pan. Sift together the flour, baking soda, salt, pepper and spices and set aside. In a mixing bowl, whisk the egg with both sugars until light. Whisk in the applesauce, oil and vanilla until smooth. Fold in the dry ingredients. Do not overmix. Pour the batter into the loaf pan and bake for 38 to 42 minutes or until a cake tester inserted in the center of the cake comes out clean. Let the cake cool for 10 minutes in the pan set on on a rack, then turn it out and let it cool completely. When cake is cool, put a piece of foil underneath the rack and make the glaze. Combine butter, brown sugar, cream and salt in a saucepan and set over medium heat. Bring to a boil, stirring constantly. Boil for one minute, and then pull it off the heat. Leave the pan to cool for a couple of minutes (I did not do this), and then whisk or stir in just enough of the powdered sugar to get a pourable consistency. Add the vanilla if using. Immediately pour the glaze over the cake, Let the glaze set before serving the cake. To make the applesauce I chopped up a pound of apples (about 2 large), put them in a pot with 2 tablespoons of water and a little lemon juice, then simmered uncovered for about 25 minutes or until soft. The apples were so soft that all I needed to mash them was a spoon. I left the skins on since a lot of people like skin-on applesauce, but for this recipe it's best to take them off before making the sauce unless you want apple skins in your bread. Also, if the applesauce seems to watery or runny, just let it sit in the pot until the water steams off. Blot it with a paper towel.